The SEAFDEC Aquaculture Department is mandated to: 1) conduct scientific research to generate aquaculture technologies appropriate for Southeast Asia; 2) develop managerial, technical and skilled manpower for the aquaculture sector; and, 3) disseminate and exchange aquaculture information. The Aquaculture Department in the Philippines maintains 5 stations: the Tigbauan Main Station and Dumangas Brackishwater Station in Iloilo; the Igang Marine Station in Guimaras; and, the Binangonan Freshwater Station and ABCDEF Jalajala in Rizal. Highlights are provided of the research programmes and activities conducted by the department during the year 2003. 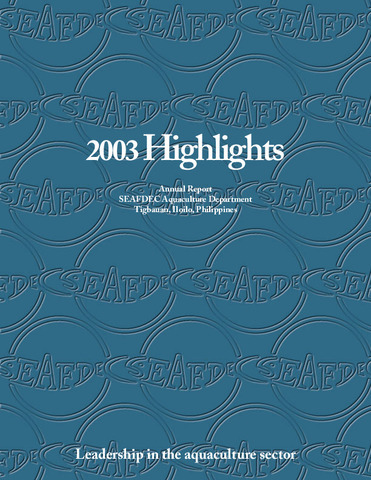 Forty research projects were implemented in broodstock management and seed quality improvement, responsible aquaculture technologies, and strategies for stock enhancement. Farming technologies for tiger shrimp, seaweed, abalone, and freshwater fishes were demonstrated at AQD stations, government centers, and private farms, including the facilities in Jalajala, Rizal. AQD further served fish farmers and the general public through our hatcheries, service laboratories, library, web sites, manuals and textbooks, fairs and exhibits, and through FishWorld. The Fish Disease Program included several research studies,a training course, and publication of a laboratory manual and a flyer on the whitespot disease. The Mangrove-Friendly Shrimp Farming Program included verification and pilot demonstration in six Member Countries, some research studies, a training course, a seminar-workshop, a web site, and production of an extension manual and a video. The Integrated Regional Aquaculture Program started this year with site visits and surveys in nine Member-Countries, and has already conducted several training courses. AQD celebrated its 30th anniversary in July with AquaBiz, a roadshow seminar of the commercially viable technologies AQD has generated from scientific research. SEAFDEC/AQD. (2004). 2003 Highlights. Tigbauan, Iloilo, Philippines: Aquaculture Department, Southeast Asian Fisheries Development Center.